A team of volunteers along with Cheshire East Ranger Ed Pilkington helped Bollin Valley Rangers Roger Brereton and Emma Houghton progress the path improvement works at Bowdon. A new path and steps have been built to replace a section that was washed away by the river. This project has also seen sections of the path being stoned and the reinstatement of a ditch to drain the formerly flooded area near the A56 Bowdon Road. 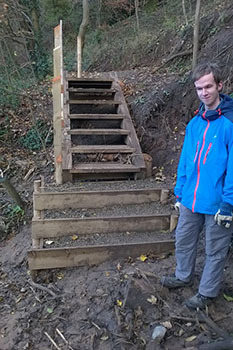 Pictured left is work experience placement Greg Roberts with the steps he helped build. Rangers Emma and Euan ran a Halloween craft and activities event at Riverside Park. 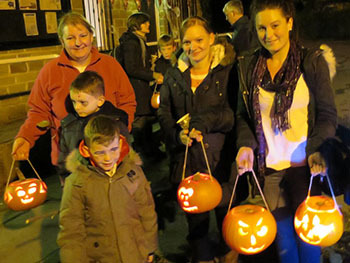 The event was fully booked and 15 children and accompanying adults enjoyed carving pumpkin, making witches broomsticks and hunting for 'witches' in the park. 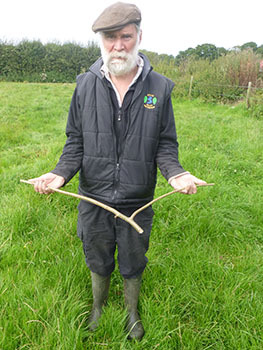 Eleven people joined Ranger Euan Murray at Wilmslow Park for a demonstration of the basic techniques involved in dowsing with a forked stick, metal rods and a pendulum. He also explain how to interpret the responses to allow divining for water. Participants then got to have a go at this ancient art them selves. 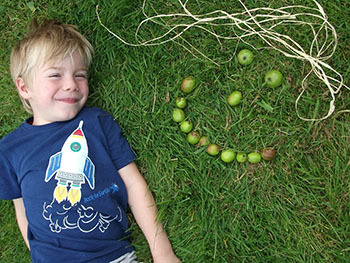 Two Summer Crafts events were a great success with all those that attended them. The photo to the left shows an image made from found items. Other creations were journey sticks, willow fish, meadow crowns, pine cone animals and rafts that were floated down the river. 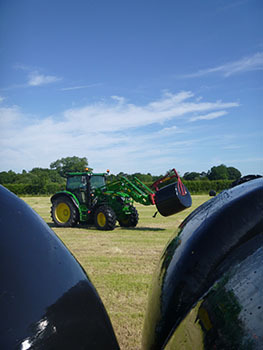 Ranger Euan Murray is busy making the most of the good weather bringing in the first of this years silage crop from Norcliffe Farm in Styal. The mown grass is wrapped in plastic to 'pickle' it ready to feed to our Longhorn cattle over the winter months. As soon as the silage is off the fields we can open them up and let the cows graze the unmown edges whilst the grass grows back. 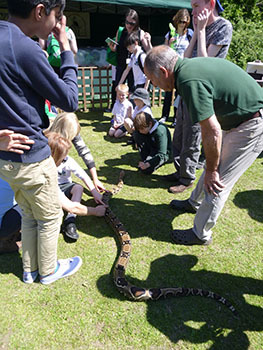 Wonderful weather helped make this years 'Countryside Taster Day' a great success. Over 400 people from over 20 organizations attended and tried their hand at the many events on offer including the animal 'petting' area shown in the photograph to the left. We would once again like to thank the forty plus volunteers that made this event happen on the day and our hosts, Beech Hall School. The volunteers provided events such as archery, pony trap rides and pond dipping. 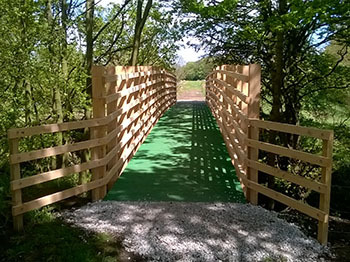 Repairs and improvements to the bridleway bridge over Redbrook near Partington have now finished. This removes the need for the diversion at the western end of the Bollin Valley Way. The works have been carried out by the land owner Peel Holdings. 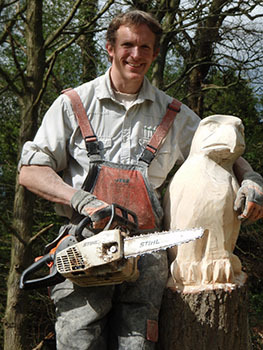 Local chainsaw carver Ed Pilkington spent the day at Rossmill working on the latest of his sculptures. The 'Bollin Buzzard' now sits on its perch overlooking the lower meadow whilst its living cousins fly overhead. Visitors to the park were fascinated to see the creative process in action and admired the skills demonstrated with the chainsaw. The tree used had been removed due to the angle it was growing at and to allow mowing up to the edge of the wildflower meadow. 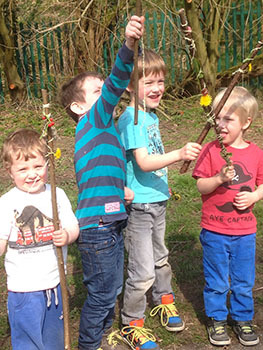 Once again the Easter Craft Event at Macclesfield Riverside Park was fully booked. The weather was fantastic and the fifteen children had a great time testing their skills at nest building, seeing if they could match up to the birds busily building their new homes throughout the valley. They also built 'journey sticks' from objects found on a walk around the park (pictured to the left). 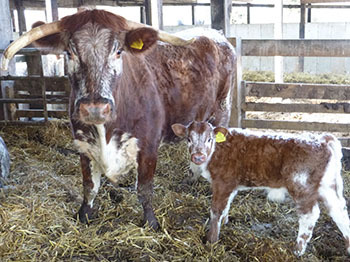 Proud mother Bollin Jenna keeps a close eye on her new calf Bollin Pascal. The majority of our cows will calf over the next tow or three months and this year we are choosing names beginning with 'P'. If you have any good ideas for names please let us know and we will use the best names on future calves. Birds are now looking for nest sites for the coming year so this is out last chance to get our bird boxes in order for their new occupants. Old nests are cleared out and damaged boxes are repaired. 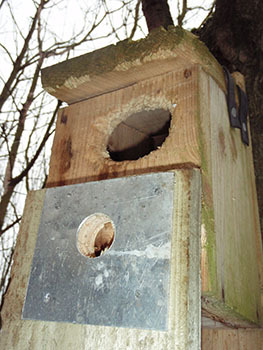 The picture to the left shows a damaged bird box and its replacement front at Newgate Nature Reserve. The damage was caused by a woodpecker enlarging the hole so that it could eat the eggs or young in the bird box. The replacement front has a metal protective guard and should help prevent an opportune lunch for woodpeckers this year! The large willow tree besides the seating area near the first river bridge at Macclesfield Riverside Park was coppiced today. The work was carried out as bracket fungi at the base of the tree indicated that the tree was decaying. In the photo to the left each trunk shows three clear bands of colouration. The narrow band of pale wood to the edge of the trunks is the remaining sound wood, the next band of slightly darker wood is decaying wood and the dark brown wood to the centre is decayed wood. 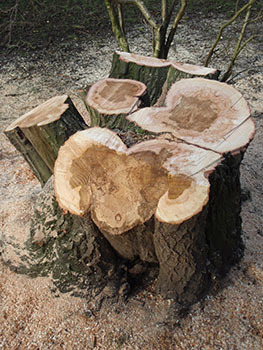 The amount of decay visible shows that coppicing the tree was very much the right decision from a safety point of view. Trees in higher risk areas are checked monthly for signs of potential problems. Community Project Officer Emma Houghton ran an art workshop with children from Adlington school as a follow from sustainability week. 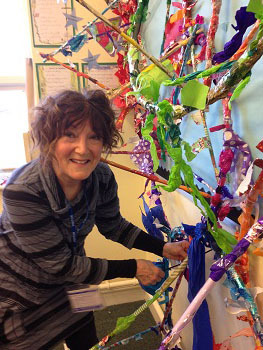 The children were asked to bring in their used Christmas wrapping paper to create a colour sculpture.